If only this was not a trick and we actually could multiply our money that would be great. Unfortunately it is a trick and here how you will learn how to perform the trick. Make sure you use the coins as described by the magician as if you use coins that are not the correct size you will run in to trouble and be caught out. 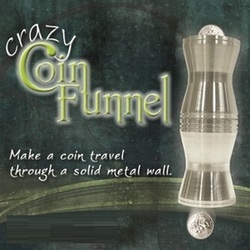 Make coins pass thru a solid metal wall! Amazing magical apparatus! Easy to perform!